9/7/2014 - So Otter River has come and gone. we have always liked this event and the people of the Otter River Sportsman's Club. First time seeing Andy and Sully this year too. And a handful of friends showed up too. So, how did we do? It was a pretty good weekend. 1st place people's choice chicken wings, 1st place people's choice pulled pork, 1st place judge wings, 4th place judged pork ribs. 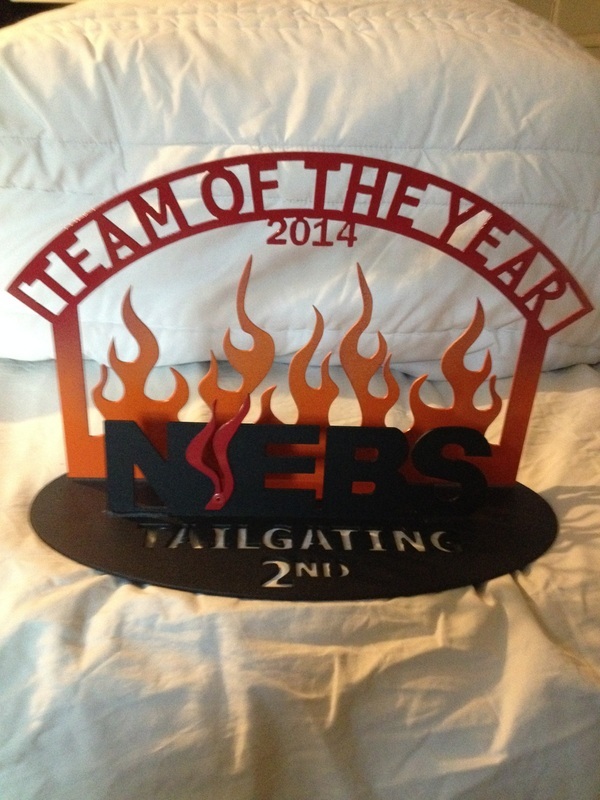 We didn't do well enough for the NEBS tailgate team of the year, but we still had a great year tailgating and improved over last year in the Tailgating division. Next week Harvard Fall Fest. Pictures from Otter River to follow. 8/3/2014 - Another good event for team Smoke'em if you got'em. 2nd place in people's choice pork ribs, 3rd place people's choice chicken wings. 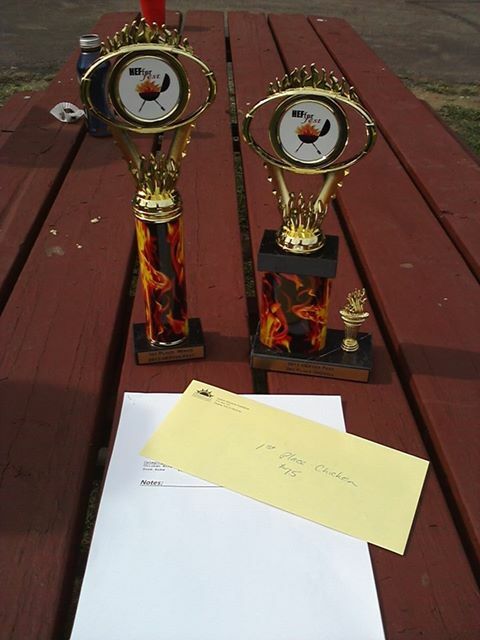 2nd place judged ribs, 3rd place judged wings, 3rd place overall. It was nice getting a call in every category and always great taking home hardware. We are really happy with our turn ins and especially with our ribs - maybe the best we have ever done. We may have learn a new trick or two (well new to us) to cooking our ribs. Had fun with many of the other teams during breaking down in the rain. Pictures to follow. 7/20/2014 - So it was a very good weekend for team Smoke'em if you got'em. We didn't place in either of the people's choice categories, but the rest of the event was great. Saturday's grilling results: Pizza -1st place, Shrimp - 2nd place, Beef - 2nd place, Dessert - 6th place and Grilling Grand Champion! Sunday's Tailgating: Chicken wings - 1st place! We had a ton of fun at this event. The folks from the Brookline, NH FD do a bang up job organizing this event. Thanks to our friends from Wizards of Que for making the down time fun. 9/15/2013 - And one more at the last event of the NEBS years. 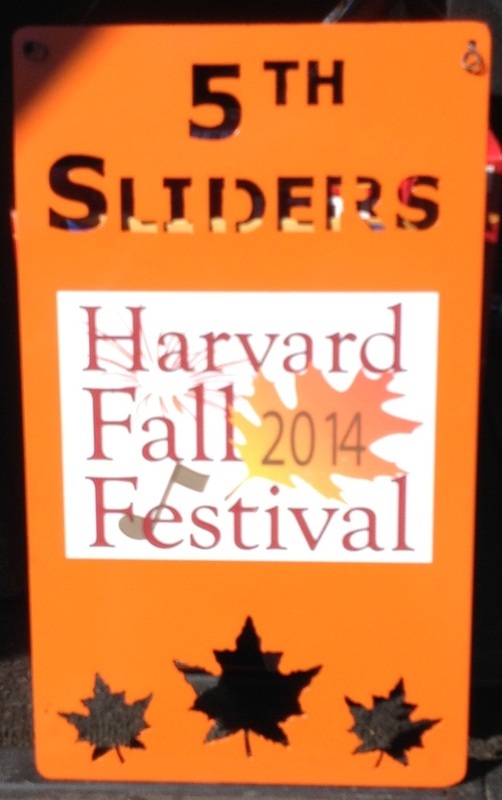 We took 1st place in people's choice sliders. We did our pulled pork topped with the team's adopted Morey family secret coleslaw recipe on Hawaiian sweet rolls. The rest of the weekend was... tough with only one top ten finish which was 7th in dessert. BBQ people are some of the best folks in the world, part of the reason we like doing it so much. Congratz to all the winners this weekend and we will see you next season. 9/7/2013 - Another great event at the Hudson HEFfer fest. And the hardware keeps coming. HEFfer fest results: 1st place chicken wings, 7th place ribs, 3rd place overall. We knew we had something special with our wings. Ribs were really good, but we know what we need to do to make them better. meet some Really nice folks there. 7/20/2013 - Very good event for the team. Our best to date. 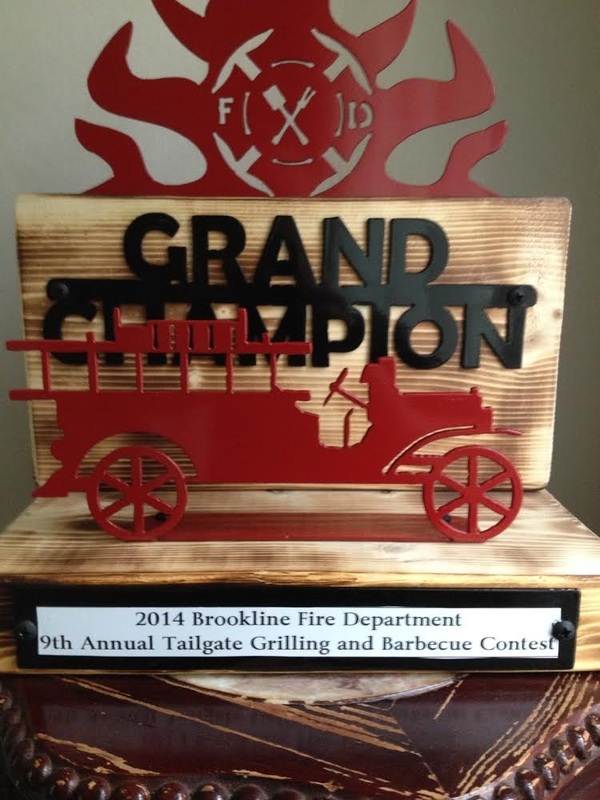 The Brookline Tailgate & Grilling BBQ Cookoff. the Grilling was on Saturday. We took 6th in Pizza, 3rd in Dessert, 2nd in Beef and 1st in Shrimp. Overall for the Grilling we were the Reserve Champion! Sunday was the Tailgate. We took 8th in Ribs and 4th in Wings and came in 5th overall. This event has been a favorite of the team's to compete in, and now I think it will always be. every category was a top 8 finish over the whole weekend and took home a ton of hardware to boot! 5/19/13 - pretty good event at the Amateur Applewood Smoke Off, Methuen MA. First with our Newbie Jack. Our first competition with the two new smokers, and our first event of the year. Three top ten finishes and top ten overall finish. The results: chicken - 18th, ribs 7th, pulled pork - 5th and brisket -3rd. 7th overall. No hardware, but good feeling with our finishes to start off the season. Next event 6/30 in Gardner, MA. 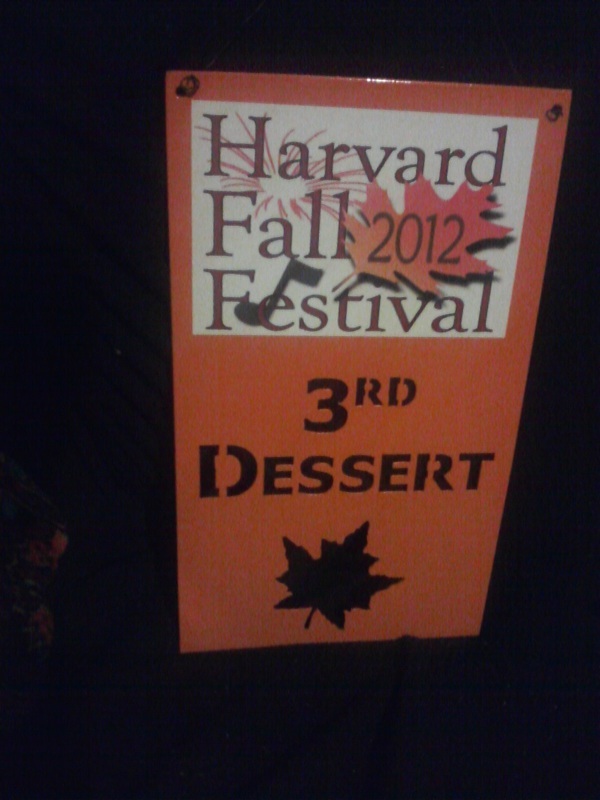 9/16/12 - Good event at Harvard Fall Fest. All 4 categories we competed in were top 20 finishes - actually they were all top 17 finishes or better for us including 3rd place in dessert scoring 177.7144 out of a possible 180 points! Two of the six judges gave us perfect scores in the category. 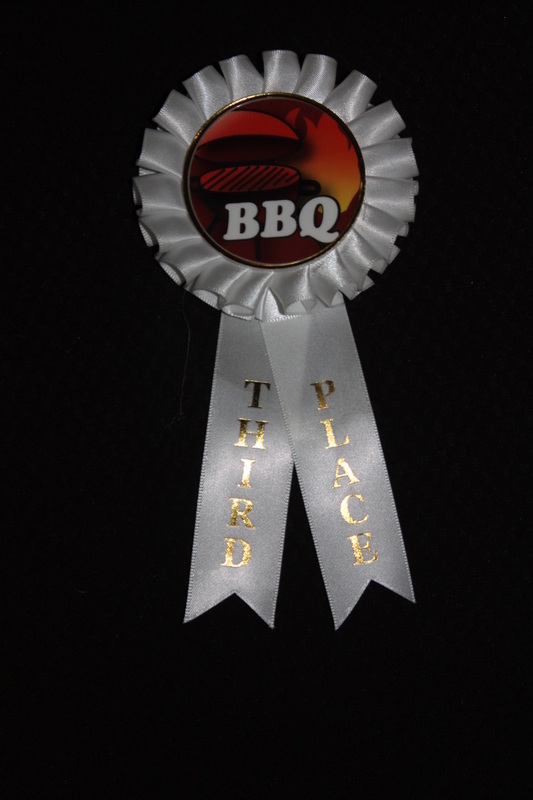 8/25/12 - Otter River: good event for the team with a 3rd place in ribs (see ribbon below) 5th in chicken wings and 5th overall. Good weather. Great people at the event/club and hats off to Andy King and crew for having the event run smooth. First event that we have been at where awards happened sooner than what was stated. 8/12/12 - Eliot Maine: What an event. This was one of the best organized events we have done. Hats off the the Raitt crew. The weather was less than perfect with heavy rain off and on again all weekend. There were two categories on Saturday - People's choice pulled pork and desert. We took almost 15% of the vote in the pulled pork, and took 2nd place in the judged desert category. Sunday - the normal KCBS meats. We had two categories that we came in 14th out of 35 teams - pork ribs and pulled pork, so we were in the top 40% of all the teams there. And there were some teams. Two former national champions as well as a couple of former NEBS team of the year teams were there competing. A special thank you to Tom Morey for his donation to the team! 8/8/12 - Brookline event was fun, just like last year, but not as successful. There were 30 teams. Weather was perfect. The mods we made to the smoker didn't work the way we thought they would. It could have been a complete disaster, but we battled through it and came out in the middle of the pack in Ribs, chicken and over all. Next event is this weekend in Eliot, ME. there are new tested mods to the smoker and we are hoping for better results. we are looking forward to this event with hopes of getting back to the awards platform. Have not posted anything in a while, sorry for that. Lexington was not one of our better events. We will leave it at that. We have made a number of modifications to the smoker that should help with cooking times, and moisture levels of the meats. We are looking forward to this weekend in Brookline, NH. this is a fun two day event with two "people's choice" categories, so come on down if you are in the area. 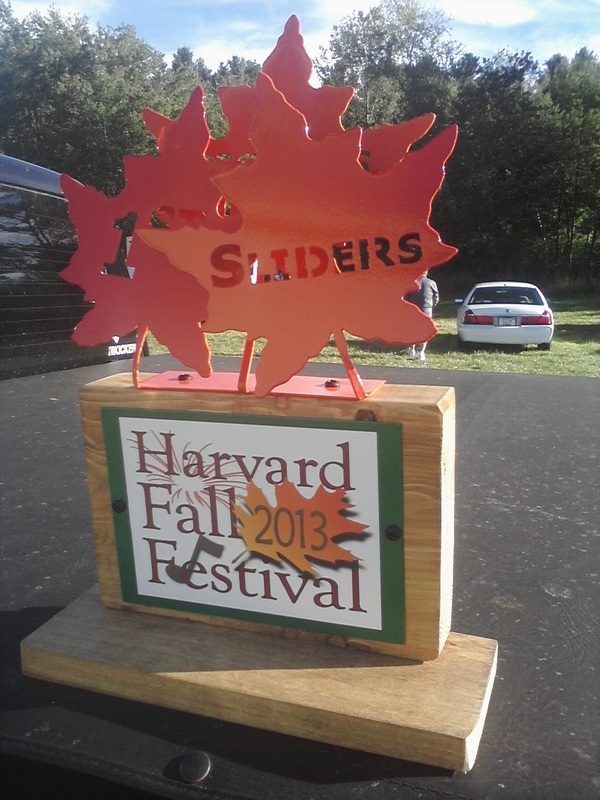 We took 1st place in the people's choice in pulled pork last year at this event (<---the metal to the right here). We like to welcome a new sponsor: Savers Bank. Our first Snowshoe had a fair amount of success. An 8th place finish in "sausage fatty" and a 5th place award in Chef's Choice which we did bake stuff shrimp (another medal for the case). It was cold. It snowed fairly hard for the better half of the day (making for a true SNOWshoe). We broke our newbie Eddie in and had a good, fun day of cooking. Smoke'em if you got'em would like to welcome a new sponsor: Royal Oak Charcoal. This Saturday, March 10th: The 19th Snowshoe Grilling Challenge - Abington VFW, 30 Central St., Abington, MA. The menu is strip steak, burger, sausage fatty and chef's choice. Turn ins start at 12:00pm. stop by and see us if you are in the area. Looks like the first warm-up event will be the 19th Snowshoe Grilling Challenge at the Abington, MA VFW on March 10th. As the name states this is a grilling event not really a BBQ/smoking event, but we will give it a shot. We got some new BBQ toys coming soon. Well, we had our first team meeting of 2012. Much earlier start than last year. The First NEBS event is early March. We are hoping to complete in a few more events this year than last. Looks like we will have one more member on the team this year and looks like all but one sponsor will be returning as well. We do have one new sponsor, Victory Cigar in Sudbury, MA who hosted the meeting. All four original members are back, but maybe in different capacities. Of course we are looking to improve over last year. Should be a fun season! So the season has come to and end. Out of 219 teams we ended up ranked in the top 1/3 of all teams in the northeast (all of New England and New York State). Many teams do not place at all in there first year. We took a 4th in Ribs, a 1st in pulled pork, and a 5th over all for a single event. Not bad. This team is not satisfied with our results. We want to do better and will next year. We are all drive guys and will show that next year. Thank you to all our sponsors, friends, and families for supporting us, believing in us and putting up with us this past season. Don't worry next season is just a few months away. Otter River BBQ cancelled due to fire at the club on Sunday the 18th. At the Pig 'N Pepper Tailgate BBQ Challenge, we placed 8th on chicken wings, tied for 4th in pork ribs and came in 5th overall in the for the event. Thanks to your votes, we placed 1st in the People’s Choice Pulled Pork Category at the 6th Annual Brookline Tailgate BBQ Cookoff!